This post explains how to submit your blogger sitemap to Yahoo.By submitting your sitemap to yahoo, they will index your web pages in yahoo search engine and provide you with detailed information related to your blog like which pages are linking to yours,popular pages in your site and you can submit and track feeds for your sites. Also,you have the choice to delete any urls of your blog if you won't want to index certain pages of your site. Submitting your site to yahoo is easy and give your web pages more exposure. All you need is a YAHOO ACCOUNT(ID).However,you don't need an yahoo ID to know the information like how many pages are indexed,etc.But,if your blog is a new one or no pages in your blog are indexed(type your blog url in yahoo search and see to check whether your web pages are indexed or not), then you want Yahoo id to submit your sites,feeds,etc. Let't see how to make yahoo index your webpages by submitting your blog sitemap. 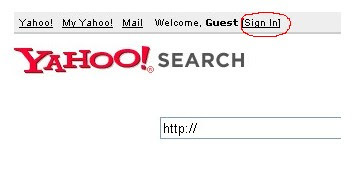 2.Click on the 'Sign in' link which is at the top of the page,see the screenshot below(If you don't have a Yahoo id, you can get one here) and sign into your accoutnt. 4.After adding your site,you need to Authenticate(Verify your ownership). There are two ways to verify your ownership.One is to upload a file to the root directory of your site which can't be possible in blogger. Another one is to 'adding a metatag' which is possible and the only way to verify ownership for bloggers.First,copy the metatag..
Next,sign in to your blogger account>Edit html and paste the metatag below the head tag and SAVE THE CHANGES,look at the screenshot below. Note:Don't remove the metatag,they will revalidate your ownership by checking your ownership regularly. 5.Next,go back to the 'Site explorer home', and check the box next to your blog url and click on the Manage button. 6.Type rss.xml or atom.xml in the box provided.It helps yahoo to discover more of your site content via your rss or atom feeds and to index your blog pages quickly whenever your blog is updated.Next,click on the add feed button. That's it.Now,you have sucessfully submitted your blog sitemap to yahoo.Check your account after a couple of days and you will see your blog indexed in yahoo search engine. Template then parsed and saved, will have to see if yahoo verify this by monitoring in site explorer over the next few days. Hope this helps.. Thank you, you have a wonderful site. Your site helped resolve my problem. 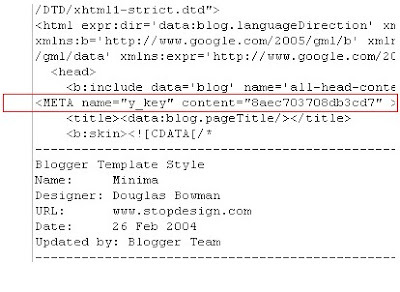 when i put the yahoo meta tag in blogger blog.what can i do? Please check whether you closed the tags correctly.It will work fine. Thank you so much for a tip. I never be able to do this without your help. this is a super guide, thanks a ton! Very useful Guide. I submitted my blog sitemap to google and yahoo by following the steps detailed by you. Thank you. Keep posting such useful stuff. XML error message: Element type "meta" must be followed by either attribute specifications, ">" or "/>". Can you help me? Wow...Nice tips. I really appreciate your effort. I am trying to put up a new blog, and one place I m definitely getting all the help is from YOU. I want your help to get rid of the problem. Please help me. has everyones blog been successful on atentication with yahoo? because I'm worried that adding the / before the > at the end will fail the athentication, and its the only way the blogger template will let me save it. @ Jay, the 6th post!! Thanks a lot. the meta tag refused to work. but when i moved it far down, it completely changed my page from black to white. but when i put it up, it didn't accept it, until I closed it like u suggested with /> thanks a lot!!! I have added the sitemaps as you said, but i burn my feeds using feedburner.Is that a problem or rss or atom do have the feeds. yeah...the only way to do it is just adding "/" before ">" but will it make yahoo fail to aunthentication sites like Nite said before? Your site is great. Are your post is to the point at all level, please tell us more thing's to rich our blog. thank u for this site. Pase does not work well at first so i have to put '/>' instead of '>' and it worked fine for me.100 thanks. Don’t show up in yahoo Search, and what exactly is a sitemap? Indeed, it needs /> to work. Your guide is very helpful to me especially when i am new to blogging and gettng indexed by the search engines..
And @ Deepak you are totally right one has to end the META tag with / or else it will have some effects on your page etc. 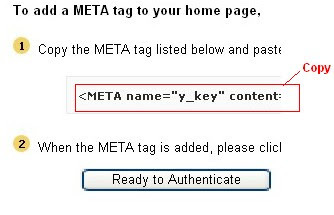 Yahoo provide meta tag with erors(the meta tag is not closed). Ok, I'll try to do your tips. I still learn about blog. Thanks man u r Rocking! Very informative site. Thanks so much. I wonder how this work on a self hosted site?? can anyone explain?? hi.thanks for your help..i successfully submitted to yahoo... but for google when i click on the verify it is saying 404 error..i just gave my blog name without http or www.even then i am facing same problem.plz help. Nice tutorial.. I hope to see more from you, Thanks. Thanks, it worked after I closed the tag. just put the /> code thingie instead of just > and it works fine. Yahoo will authenticate it. Put it right over or under your google authenticate code. Myself didnt get the 5th Step. i got error message same like this but i change the " to ' and added a / at last. and i have also changed the order of content and name... i don't know what will happen, i am waiting a good result. I also din't find 5th Step. For whom didn't manage to insert meta tag, actually it is easy, just add *<*/*META*> after your META tags, done ! Can i Add my Blog (Blogger) to Yahoo and Google Both ? Hi,I just want to know.. if I already use meta tag for google search, can I use meta tag for yahoo search in the same blog ? or I only have 1 of them , google or yahoo ?.. sorry.. cause I'm a new bie..stupid women too hehehhe but thx a lot for your clearly explanation..
Hi! I noticed that I erroneously indexed my site in Yahoo WITH WWW. How can I remove that? Please help. Thanks! Still not add my blogger url to yahoo search. Thank you very much for your useful article.You are doing great job my friend. crissy, all you have to do is delete the one with www. and put it back again. I was going to warn everyone that the metatag will not work unless you add a forward slash before the closing tag, but I see other's have asked about that and still others have answered it.